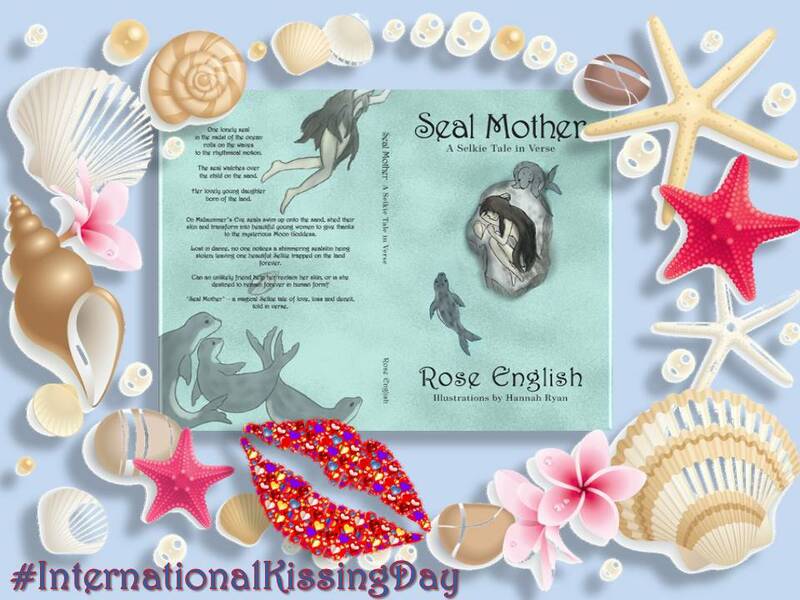 On Midsummer’s Eve seals swim up onto the sand, shed their skin and transform into beautiful young women to give thanks to the mysterious Moon Goddess. Lost in dance, no one notices a shimmering sealskin being stolen; leaving one beautiful Selkie trapped on the land forever. Can an unlikely friend help her reclaim her skin, or is she destined to remain forever in human form? Living on ‘England’s Green & Pleasant Land’, among the gentle rolling hills of the Herefordshire Countryside, Rose’s house is wall to wall books. She even has a ‘Leaning Tower of Paperbacks’. 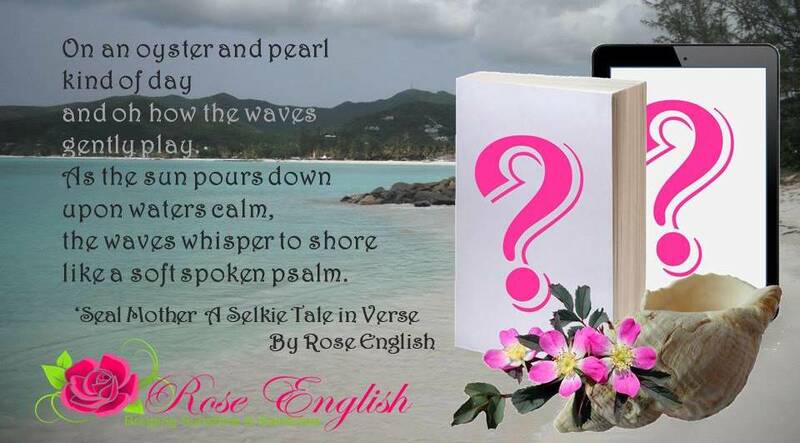 Rose is a dreamer, preferring a simple & quiet life. Often spending time alone, although never lonely, being ever surrounded by great characters when lost in a good book. She loves theatre and the arts, adoring live performances on stage. Rose has very eclectic tastes. Working as a school librarian, and sharing her love of books with children, was the best job she ever had. However, life moves on and another chapter was only a page turn away. Finally a big thank you to all who participated. 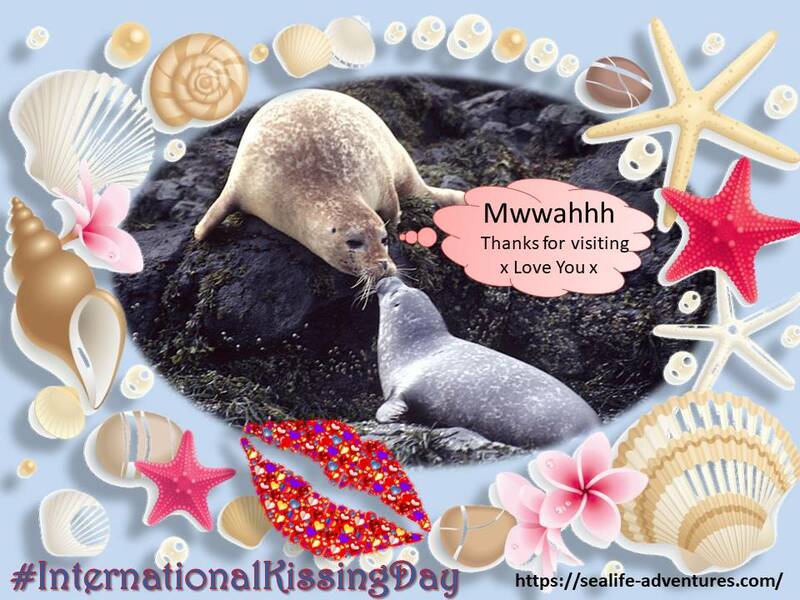 It has been a pleasant, but very busy evening and I thank you all for visiting on #InternationalKissingDay Hope you have been giving out those token’s of love to your nearest and dearest? Well you have all waited long enough so let me share with you a final teaser and then the big reveal. I hope you like it. The cover illustrations, when I reveal them shortly are by the very talented young artist Hannah Ryan. My lovely Indie Author friend Maria Gibbs the Dreams to my Roses when we are at book events as Roses & Dreams let me use one of her beautiful holiday pics as a background. 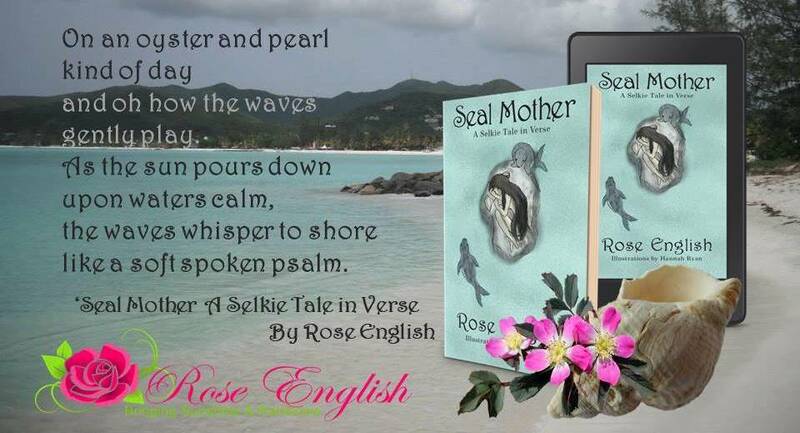 You can see it above in the teaser, but watch how it makes the beautiful ‘Seal Mother ~ A Selkie Tale in Verse’ stand out in the reveal. There will be a chance to win a copy of the book at this evenings event over on Facebook later. Go check out the page by clicking the image below. Giveaway will be open until 12noon GMT UK Sunday 7th July 2018. Well I do hope you like it? Love to hear your thoughts, the Kindle Copy will shortly be available to download on Amazon. Hardback versions can be ordered through me very soon. I made a short sample of a reading from the book have a listen when you have a spare moment. Click the image to enlarge. The illustrations are all by the young, talented, Hannah Ryan. The Seal-Maid & Fisherman Marry. 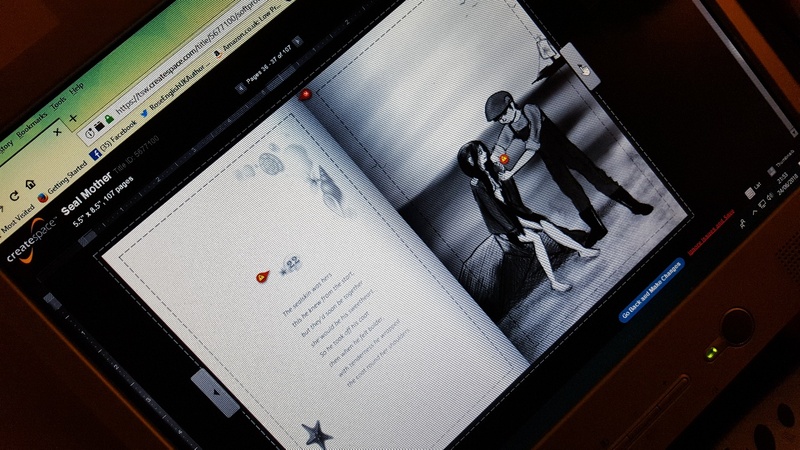 So for today’s sneak peek you should already know that the handsome fisherman guided the Selkie home from the beach. Slowly she is adapting to her life on land but she longs for her family in the ocean. Still no wiser about her missing sealskin, (which is locked in the deep dark, chest in the bedroom). She believes the fisherman to be a kind soul, he does indeed love her dearly and treats her with great kindness. The magical creature has brought light into his mundane life, and one day he asks her to marry him. It has been many weeks since the Seal-maid’s beautiful pelt disappeared and she is losing hope. She needs protection in this strange world. Fearing humans, she keeps well away from them. However, slowly she grows fond of the fisherman, with his gentle caring ways. 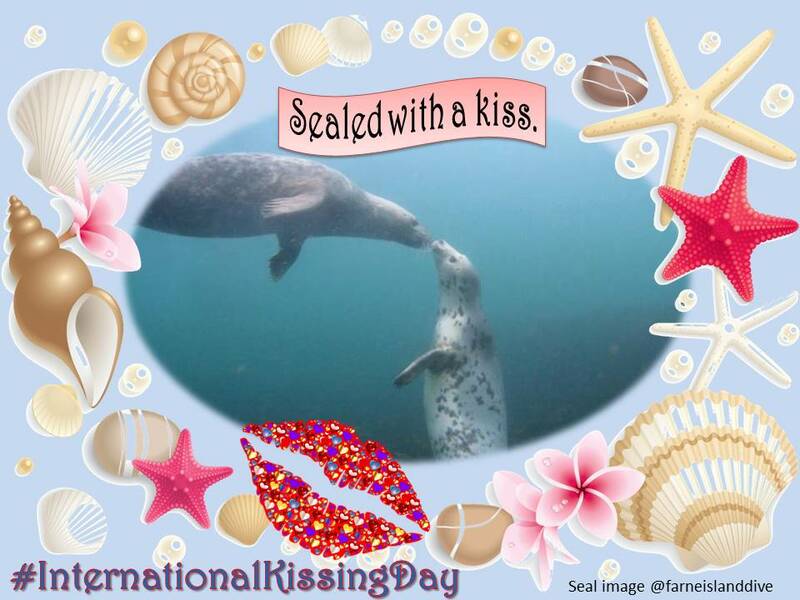 Eventually the Seal-maiden gives him a little piece of her heart, and then the pair are joined in wedlock. she was losing all hope. 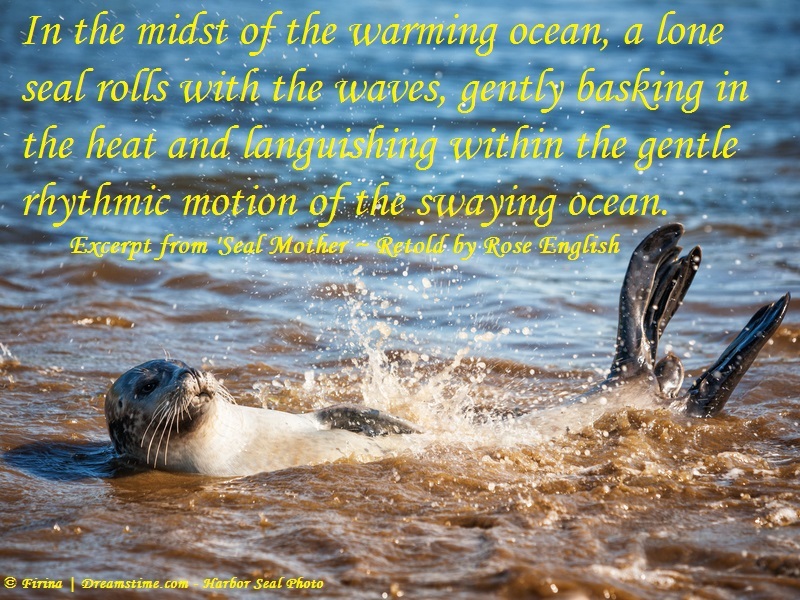 I hope you are enjoying these little insights into my Seal Mother – Selkie Tale in Verse. 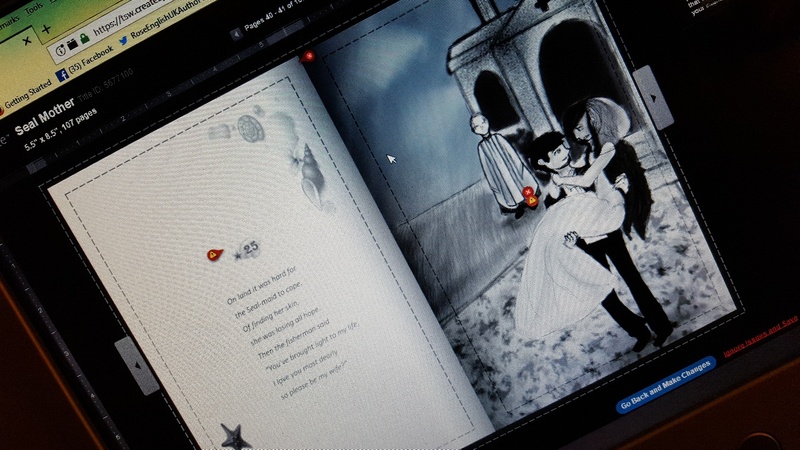 So the latest news is that Hannah is working on the cover for the book to be in FULL COLOUR, and fingers crossed we may be able to do a cover reveal on Sunday for #IndiePrideDay. But to tease you a little bit more here is a sketch of one of the seals that could very well be adorning the cover. Watch this space. Thanks for visiting if you enjoyed being here please share with your reader friends. The illustrations are all by the young, talented, Hannah Ryan. So for today’s sneak peek the beautiful Seal-Maiden is trapped in her human form – naked. Having had her sealskin stolen away on Midsummer’s Eve. (Click the image above to enlarge). Meanwhile the young fisherman, who actually stole the prized shimmering skin, (under the sight of the Moon Goddess) is strolling along the beach hoping that the Selkie will be there and he can take her home to be his bride. she would be his sweetheart. the coat round her shoulders. The handsome fisherman falls madly in love, he takes the lost, lonely maiden back to his cottage on the edge of the beach. He feeds and clothes this magical creature, whom he longs to take as his own. He is determined that she will become his wife. All she longs for is to find her skin and return to her family in the sea. The Seal-maid is quite unaware that her beautiful pelt is only in the next room, locked away. Hidden from view in a deep, dark chest. It is unbelievable how quickly the tale is now coming together, after my sister-in-law Sylvia suggested I write the story in verse. 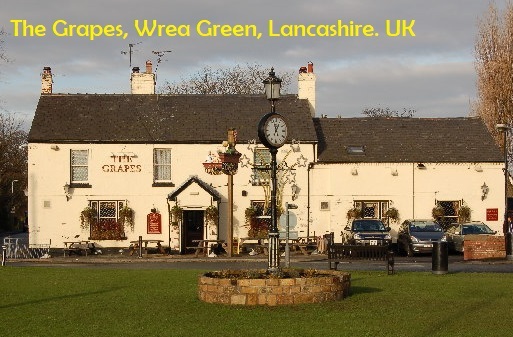 It was only a matter of months since I went to visit her in Frecklton, Lancashire. 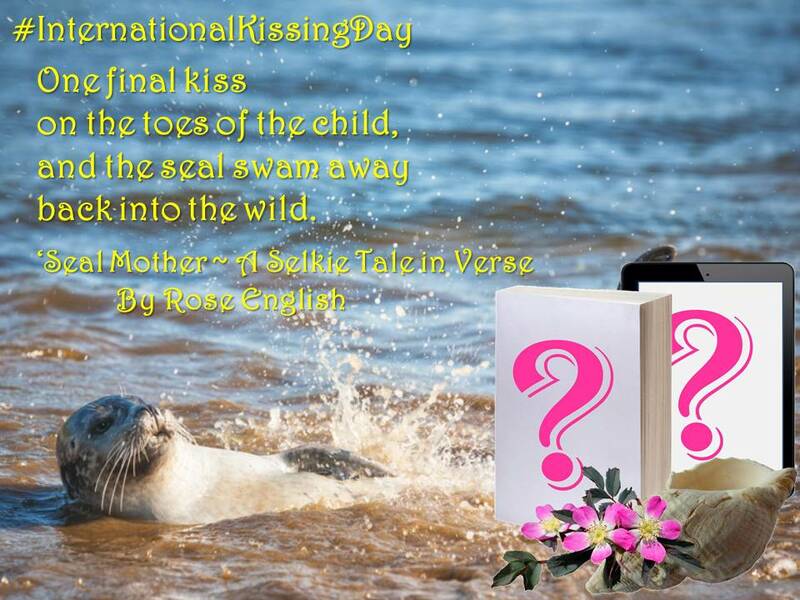 Sylv had to go to work, so she told me to perhaps look at turning the Seal Mother into a poem. Using a similar style to Young Ebenezer ~ A New Christmas Carol which I released Christmas 2017. So I took myself to the pub, settled down with a latte (and then a white wine spritzer, well it was a pub it would have been rude not to). Within the 2hrs I waited I had re-written the whole story, and converted it into approximately a sixty verse poem. WOW I admit I shocked myself. Hannah Ryan was sent to me by fate I believe. But I’ll tell you about that in another blog. 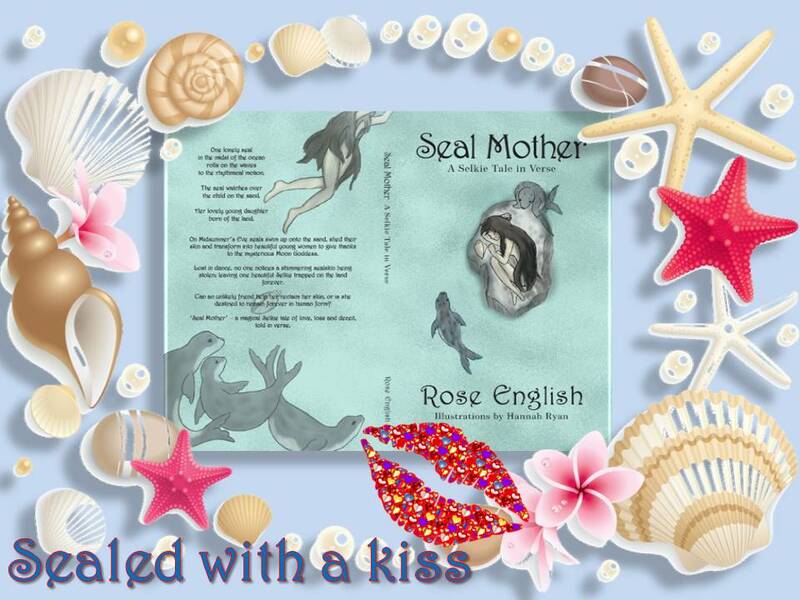 Oh my goodness I cannot believe how time flies, ‘Seal Mother’ has been a work in progress (WIP) for many years now. I cannot believe that when I just did a blog search it took me back to 2015. Below is a teaser from my original story. Click HERE to go to the earliest post I found. ‘Seal Mother’ is finally about to be released. It is the re-telling of a Selkie Tale. Legend has it that on certain times of the year a seal can come onto the land, shed their skin and take on a human form. Sadly if a seal had their skin stolen they would have to remain in human form. It is said fishermen often stole the skin and hid it away so as to get themselves a bride. Many stories of the Selkie Sealfolk can be found online but my favourite source is Orkneyjar and the Heritage of the Orkney Islands. Click the Selkie image below to visit the website to find out a whole wealth of information on these magical creatures. Now I am in the middle of final formatting, and even put my almost completed book into the CreatSpace reviewer for proof reading. I must say I am secretly pleased with how things are turning out. Take a sneak peek at the images below. The illustrations are lovingly created by Hannah Ryan a wonderful young lady currently studying at art college in the US. Click the image to enlarge (opens in a new window). Thank you for visiting, watch this space for further updates and a cover reveal coming soon. #FolkloreThursday and today as previously mentioned is the theme of the sea. So here I am sharing my #WIP or Work in Progress. Selkie~Seal Folk are all said to be strickingly handsome or stunningly beautiful. The males are said to come ashore to seek out amorous encounters with women married or unmarried he cared not which. If a maid wished to call upon such a man she only had to shed 7 tears into the sea at high tide. Click the image above to find out more on the wonderful Orkneyjar website (Opens in a ne tab). 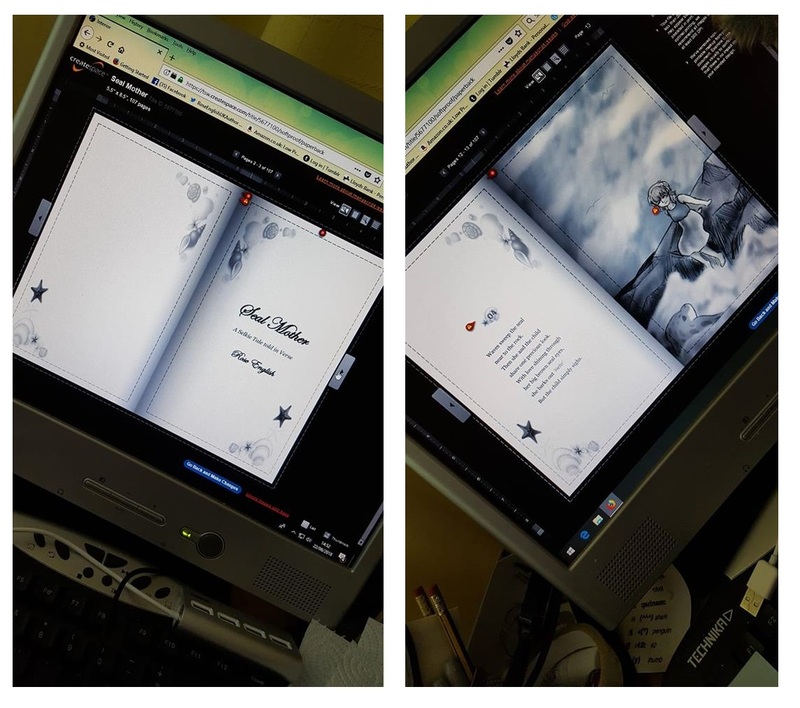 Next is a teaser from my #WIP sharing with you the words of the old folksong. Standing vigil upon the rocky outcrop at the edge of the vast ocean is the nurse-maid. Hair now as white as the foam upon the crest of a wave, her routine has not changed in half a century. The fine mist tickles her aged face and the salty sea droplets lodge within the wrinkles of time upon her forehead. In her hand, clutched tightly is a golden rope of kelp, secured to it is a small shell shimmering in rose gold, a gift given to their son. Daily she prays that the family will be re-united but in her heart she knows all are lost. Weary bones now barely support the frail, stooped body, and as twilight approaches she feels the tiredness taking over and just wishes to lie down upon the sand and let the waves carry her out into the open waters. 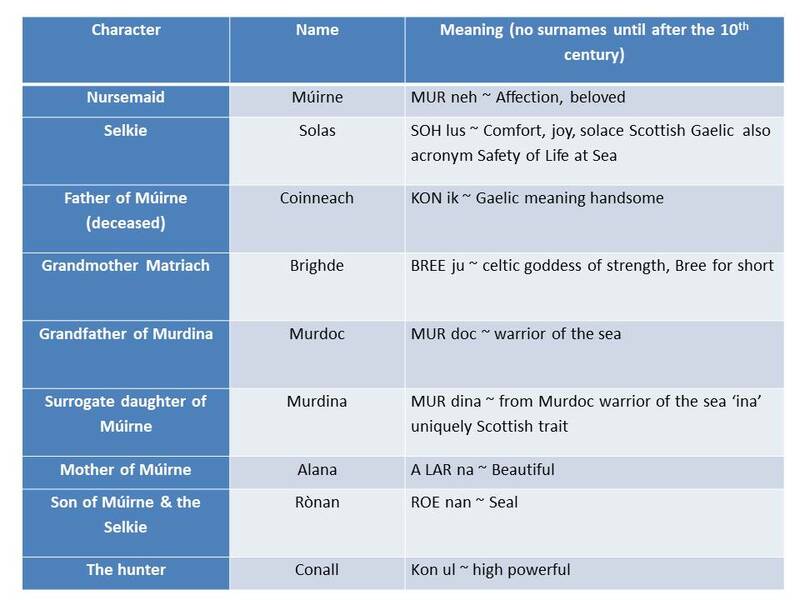 In her youth Múirne was loved by many because her great kindness over spilled from every pore. Like her grandmother Brighde she had become a nurse-maid caring for the fishermen and their families, who lived at the furthest edge of the land. Múirne had little time for a love of her own, always putting others first. Her father had been a fisherman, but like so many others he had lost his life at sea leaving a young widow and babe barely out of the crib. Alana the child’s mother was heartbroken and she became bitter blaming the girl, if not for the extra mouth to feed Coinneach would still be there. He would never before have gone out in an approaching storm, but they needed to eat so he braved the waves but never returned. As the girl grew she spent more time with her grandmother in the small but homely cottage on the edge of the village. Granny Bree taught her the healing ways using herbs grown in her seaside garden, and kelp taken from the water’s edge. The pair would sit in companionable silence listening to the crackle of the fire and the ocean crashing upon the shingle shore. As Brighde took more and more care of her granddaughter Alana felt herself becoming free of the burden of motherhood. Eventually she left the little coastal village with a fish merchant who delivered fresh fish to the hotels in the city down in the south of the country. It was no great loss for the child for she loved her grandmother dearly and the old nurse was more a mother to her than her own ever could have been. Wise beyond her years the girl grew strong and intelligent with a love for all things. Her caring nature passed down from the great mariachi (matriarch). Life was good.